Israel has launched missiles into the Gaza Strip in response to a missile that was fired from Gaza. The Israeli Defense Forces (IDF) said “a projectile hit an open region in the Ashkelon region” without causing any injuries. No group has claimed responsibility for the attack but the Jewish State holds Hamas responsible for all hostilities originating from Gaza. 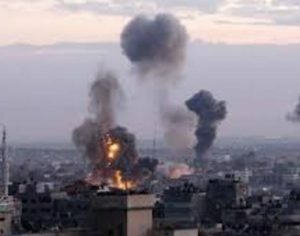 The IDF responded by launching airstrikes targeting “two Hamas posts in the northern Gaza Strip.” Security sources said the Ezzedine al-Qassam Brigades, the military wing of Hamas, was the target. The airstrikes were carried out early Wednesday. Ayman Sahbani, an emergency director at Gaza’s Shifa Hospital, said three people were wounded. One of them is reported to be in a critical situation. Hard-line Islamist groups opposed to Hamas’ rule frequently launch rockets into Israeli territory. The groups tend to accuse Hamas of failing to resist the occupation. The rise of tensions in the area could complicate the planned visit of UN Secretary General Antonio Guterres before the end of the month. Israel and Hamas have fought three wars since the Islamist movement took control of Gaza a decade ago. The most recent in 2014 left at least 2,000 Palestinians dead, including more than 500 children. The Israeli side recorded 73 casualties, mostly soldiers. Written by: Jaber Ali on August 9, 2017. Posted by Jaber Ali on Aug 9 2017. Filed under Headlines, World News. You can follow any responses to this entry through the RSS 2.0. Both comments and pings are currently closed.